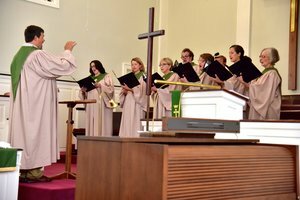 Under the leadership of Chuck Reynolds, the adult choir is a very important part of the life at Broadmeadow UMC. Made up of about 15 voices, their primary task is to help lead in worship every Sunday during the 10:30am service. The music is always diverse and varied, but regardless of the style or genre, the songs are intended to praise and glorify God. Rehearsal takes place on Sunday right after worship in the choir room located on the second floor on the south side of the educational wing. For more information, contact Chuck Reynolds.